All winter long I pine for spring and summer. I forget that summer means black snakes are eyeing our new chicks, coyote mothers are extra hungry to feed their pups — scaring the small-dog walkers, and our own irascible dogs seem intent upon poking their noses into places where baby copperheads lurk. But, honestly, most of my “summer safety” energy goes into keeping OTHERS safe from us. 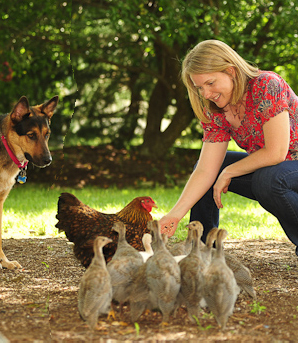 Jake eyes Mama, the chicken, and her adopted Guineafowl brood under Betsy’s watchful eye. After a spring of keeping the bluebird eggs safe from snakes, having Charlie-cat bring us a “gift” fledgling would be too sad to bear. Sydney, the box turtle, enjoys winter indoors in a Plexiglas habitat, but we have to move it from direct sunlight to keep him from overheating once the summer sun comes (he can’t go outside yet because his outdoor turtlearium has been commandeered by our aggressively maternal hen, Mama, who is raising adopted Guineafowl babies again. So, sure, keep your dog’s feet safe from hot sidewalks and carry lots of water, keep your cat cool or dog safe during a heat wave, but also put bells on Kitty, if she goes outside [learn 6 reasons you might let your cat outside and why not to], and make a ruckus when you’re in nature so no snakes or baby animals, like raccoons, get surprised (and injured) by Spot’s curious nose. Nothing dampens a pretty day like having your best friend present you with the spoils of a killing spree!